Although I live in North Carolina, I try to visit the orchard and see my dad frequently. I brought home some Jonathans, my favorite cooking apple, as it was my mother’s. 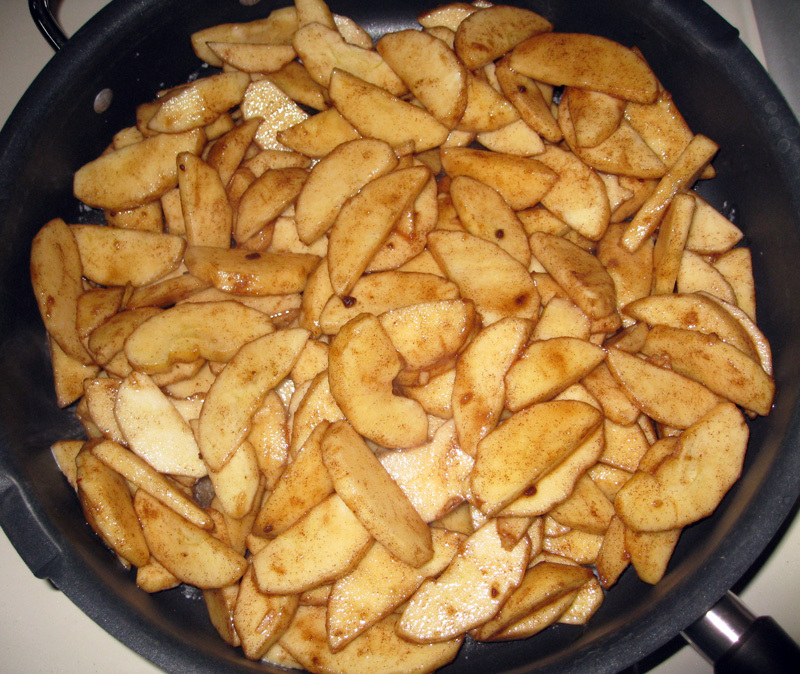 I use a half-peck bag to make a large skillet of fried apples. They are wonderful warm served over vanilla ice cream. They are good in fried pies or even just spooned into a small flour tortilla, folded over and fried in a skillet with butter and sprinkled with a bit of cinnamon sugar. People in North Carolina also like fried apples with breakfast or served as a side dish with pork. Peel and slice about 5 pounds of apples for a large skillet full. The apples will reduce once cooked. I also use re-hydrated dried apples that I dry at home, and we can’t tell the difference from fresh apples when making this dish. Melt 1/2 to 1 stick of butter in a large, heavy skillet. This can be reduced or eliminated by using some Crow Mountain Orchard cider. In a large bowl, I mix the apple slices with cinnamon and sweetener. My preference is a mix of white and brown sugar enough to coat the apples. Taste a raw slice, and if there is enough sugar and cinnamon that it tastes good to you raw, it will be enough for cooking them. If I am making it for just me and my husband, I use Splenda or Stevia since we watch our sugar intake. 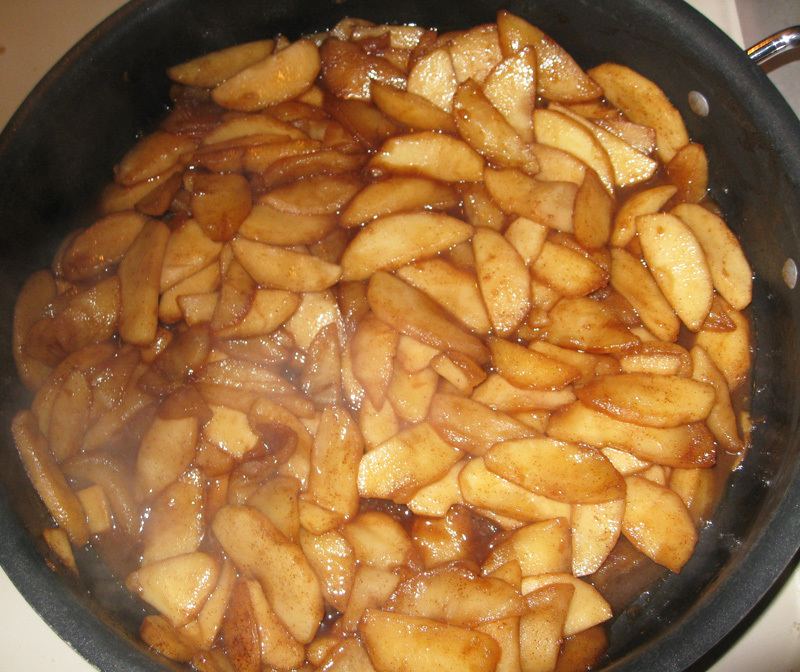 Add apples to the melted butter in a hot skillet, cover, and cook over medium heat until apples just start to soften. The time varies by the variety of apple you use. The apples will give off some juice. Remove lid, and cook apples until the juice/syrup starts to thicken, but don’t cook them dry. It usually takes 20 to 30 minutes of cooking. Jonathan and Granny Smith hold their shape very well, but other varieties may cook up. That is actually fine and many people prefer them softer. Or just tell your family it is chunky applesauce and you meant to make it that way! Leftovers can be refrigerated or frozen. Warm them before serving. Laura Red Apples are ripe!